Below is the 2018 season recap for the Atlanta Falcons. Coming into the year with Super Bowl aspirations, it was a disappointing 7-9 season for the Atlanta Falcons who battled injuries early on while their defense took a step back from 2017. 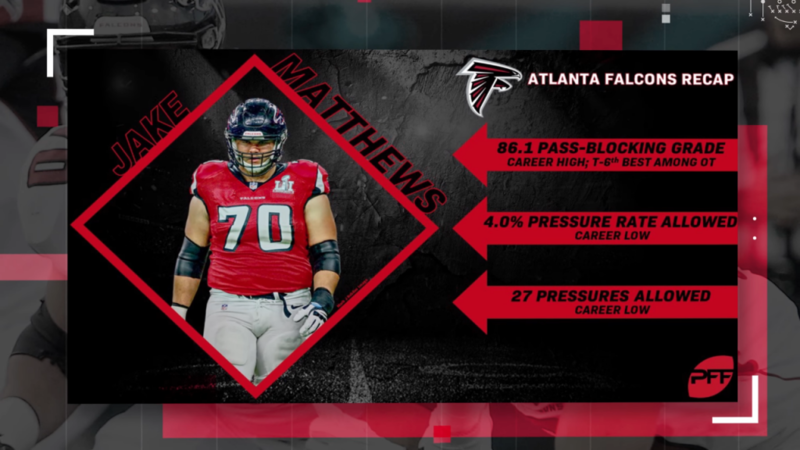 Left tackle Jake Matthews finished with the best pass-blocking grade (86.1) and fewest pressures allowed (27) of his career. His pass-block grade tied for fifth-best among tackles. Interior defender Grady Jarrett finished with a career-high 91.0 grade while leading the team in total quarterback pressures with 53 and ranking second in stops with 30, despite missing two games. Jarrett also ranked fourth in pass-rush win percentage (16.6%), sixth in pressure percentage (12.3%), and posted a run-stop percentage of 9.7%. 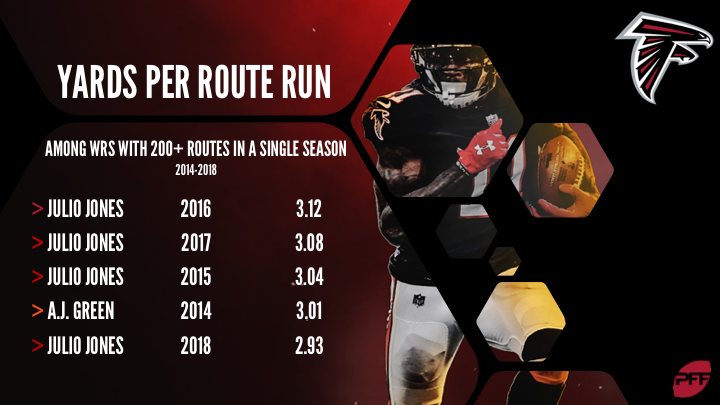 Julio Jones was exceptional once again, finishing with the third-highest grade among wide receivers. His 2.93 yards per route run ranked first in the NFL, marking the fourth straight year he paced the league in this all-important category. 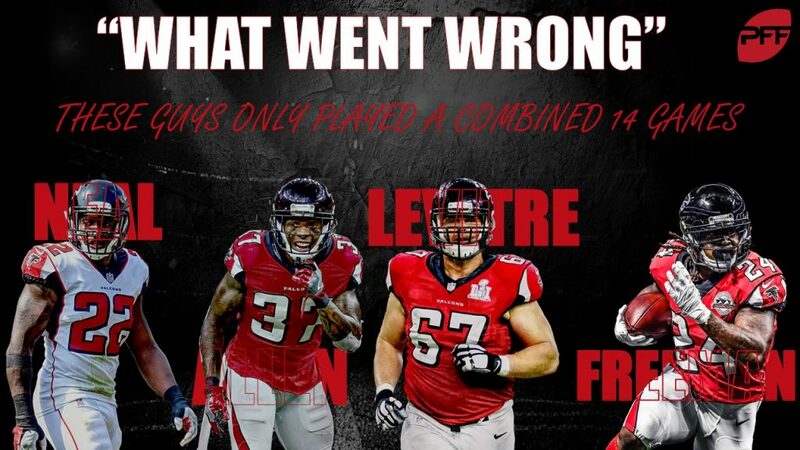 Injuries decimated both sides of the ball as Devonta Freeman, safeties Keanu Neal and Ricardo Allen, Deion Jones, and Andy Levitre played a total of 14 games. Robert Alford saw a big drop-off in his play. 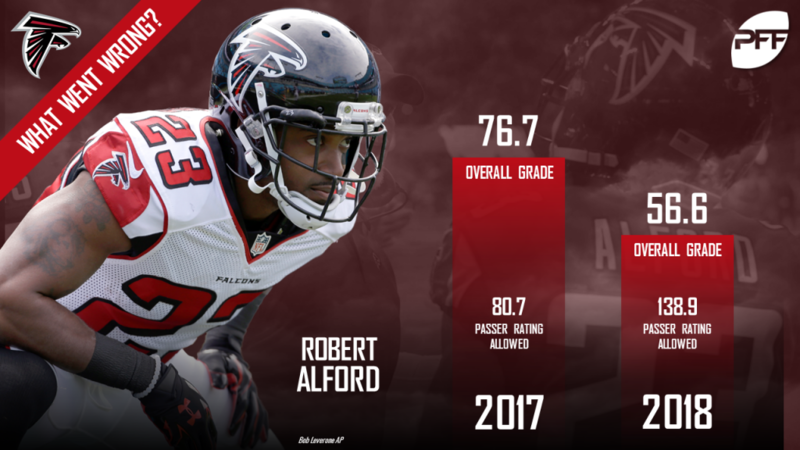 After a career-best 76.7 grade in 2017, Alford graded at just 56.6 in 2018 and allowed a 138.9 passer rating into his coverage while also picking up 12 penalties. 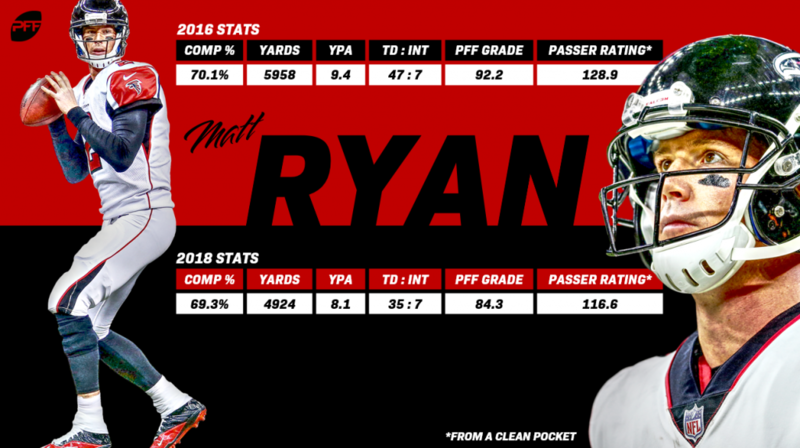 While Matt Ryan‘s box score stats were similar to his MVP campaign in 2016, inconsistency plagued the offense, and a four-game stretch saw the Falcons score less than 20 points in each game as they fell from 4-4 to 4-8 on the season. Julio Jones was the highest-graded player at 90.9 overall, good for third among NFL receivers. He led the league with 1,677 yards while converting 79 first downs, good for second in the league. 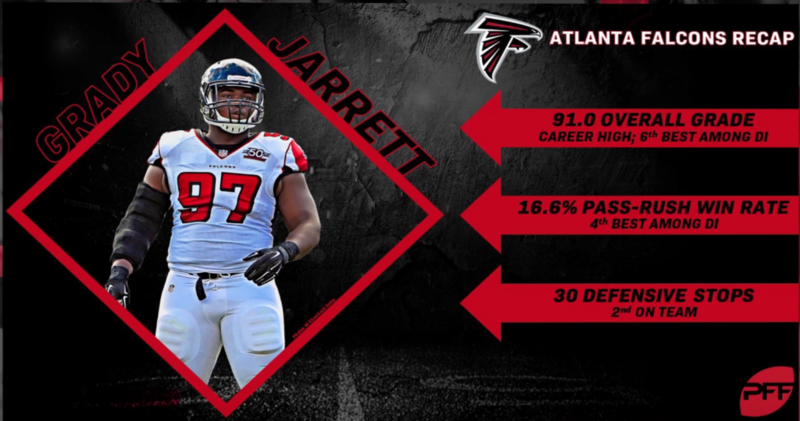 Jarrett’s 91.0 overall grade paced the defense, and he hits free agency with his stock at an all-time high. He set career-highs in pressures 53 and pass-rush grade at 86.7. Damontae Kazee stepped in for the Falcons’ injured safety tandem and played the second-most snaps on defense with 991. He had the second-highest grade on the defense at 77.9 while leading the NFL in interceptions with seven. First-round pick Calvin Ridley lived up to his hype with 821 receiving yards and 10 touchdowns, both highs among rookie pass-catchers. His eight dropped passes kept his receiving grade at only 70.5, but he had a passer rating of 125.8 rating when targeted, eighth-best in the NFL. The Falcons may have disappointed in 2018, but they still have plenty of pieces to make another Super Bowl run in 2019.